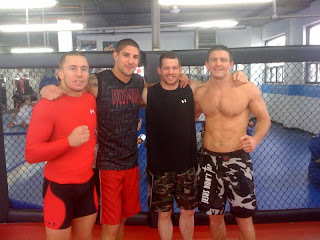 Here I am with @GeorgesStPierre, Tom "Kong", and @BrendanSchaub after practice at Tristar. We had a light grappling day and then went to eat. Now we are resting and later we will go to eat in downtown with all the guys. Maybe we will catch a movie. I wonder what's out?